KUER can be heard throughout the state of Utah and into surrounding states by way of one of the most extensive translator systems in the country. 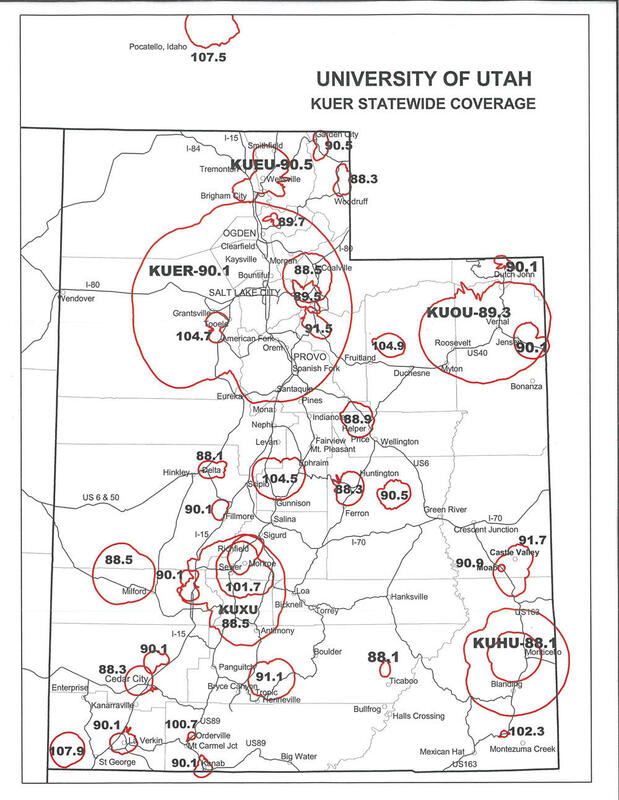 KUER broadcasts at 90.1 FM from a transmitter at 9,052 feet on Farnsworth Peak in the Oquirrh Mountains. Due to signal blockage by mountains and attenuation by distance, our signal is not found at 90.1 throughout the entire state. Use the list of translators or the map above to find KUER's frequency in your area. Please note: The complicated topography that makes Utah such a beautiful place also makes it a difficult state to cover with a consistent radio signal. KUER's signal may not reach some low-lying areas or spots surrounded by high mountains. For information on the signal in your area, or to try to fix a problem, see our list of Frequently Asked Questions. To report a problem with our radio signal, contact the engineer, Lewis Downey. You can also stream KUER 90.1 FM and our two HD music channels from your smartphone or tablet. Download the KUER app for Google Play and Android devices. Download the KUER app for iTunes and Apple devices. In addition to our main KUER station (with an award-winning mix of NPR and local news programming broadcast on 90.1 FM), you can now stream BBC on KUER (24-hour BBC World Service) as well as Classical KUER (traditional and contemporary classical music). To stream any of these channels click the small down arrow in the gray bar at the top of any of KUER's pages and select the stream you'd like to hear. Or for easier listening, download our mobile app in iTunes or Google Play. If you have any problems with streaming, please read through our list of troubleshooting tips. "Hey Siri, play KUER radio." Find out how to listen to KUER and NPR on your smart speaker with NPR's handy how to page. We are expanding our coverage in Southwestern Utah! Click here to learn more. Where can I find KUER in my area? KUER's signal is most commonly carried at 90.1 on your FM dial. In some areas of the state, however, our signal is at a different frequency. Check the Frequency List pdf above to find KUER's frequency in your community. KUER's transmitter is high atop Farnsworth Peak in the Oquirrh Mountains. The signal is carried throughout Utah by way of a network of 34 translators, which repeat the signal broadcast by the transmitter. We also have four new full service FM stations located outside of the Wasatch Front. KUEU 90.5 in Logan, KUHU 89.3 in Roosevelt, KUOU 88.1 in Monticello, KUXU 88.5 in Monroe and KUQU in Enoch. Why does KUER's signal get messed up when I'm driving downtown? You're experiencing what's called "multi-path distortion." In the downtown area, radio signals bounce off of buildings, so you car radio will often pick up our signal from 2 or more directions, causing distortion. If you inch your car forward or backward slightly when you're at a stoplight, the signal should clear up. Why is KUER's signal fuzzy on my home stereo? "Multi-path distortion" is most likely the culprit here, too. A nearby building, wall, or even mountain may be bouncing the signal to your home receiver and interfering with the main signal you're getting directly from the transmitter or translator. Try moving your stereo's antenna at least six inches in all different directions. You should be able to find a spot where the antenna picks up just one signal. I've tried everything and I'm still hearing "noise" at KUER's frequency. What should I do? Call or e-mail Lewis! It IS difficult to pick up our signal in some areas, because of a signal shadow from a nearby mountain, because you're in a very low-lying area, or for some other geographic region. However, the problem may be something we can do something about, like a malfunction in our transmission hardware or at the translator in your area. You are our first line of defense when it comes to transmission problems, though, so let us know right away! Why am I hearing a different station on KUER's frequency? If moving your antenna to end multi-path distortion doesn't help, contact us! The problem could be fairly serious for our signal and we need to look into it. If you listen to us on a translator (outside the Wasatch Front), there may be a more powerful transmitter broadcasting in the area, and we need to check things out with the FCC.